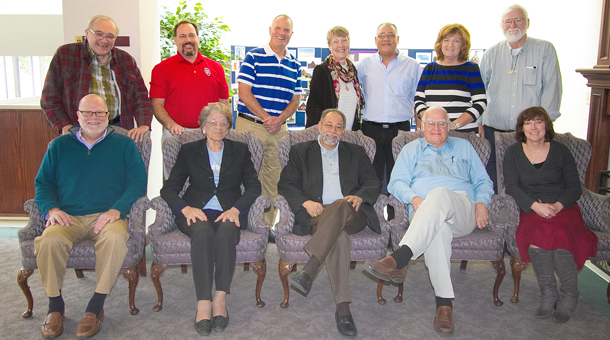 The DDG Board at its meeting in Omaha on October 21, 2013. An album of photographs from this meeting is available here. The members of the Board of Directors of the Dominican Development Group met in Omaha, Nebraska, on Monday, October 21, 2013. The Board traditionally meets twice each year, once in Santo Domingo immediately following the annual convention of the Episcopal Diocese of the Dominican Republic, and once in one of the DDG’s companion dioceses in the United States. This meeting was held in conjunction with the 146th Annual Council of the Episcopal Diocese of Nebraska in Omaha from October 18-19. The host hotel for this meeting was the DoubleTree by Hilton Omaha Downtown Hotel located at 1616 Dodge Street, Omaha, Nebraska 68102. Board members who arrived early attended the first business session of the Diocese of Nebraska’s convention on Saturday, October 19. The Rt. Rev. Julio C. Holguín, Bishop of the Diocese of the Dominican Republic and a DDG board member, addressed the convention during this time. Board members who were present on Sunday, October 20, had an opportunity to volunteer to speak at local Episcopal churches about the work of the DDG and the Episcopal Church in the Dominican Republic. St. Andrew’s Episcopal Church in Omaha hosted a “Dominican Night” for the Board members starting at 5:00 p.m. on the 20th, with a social hour followed by dinner and entertainment. For more information on this event, contact Bill Kunkle (813-400-2722; director@dominicandevelopmentgroup.org).